"You can hear the inside of his guitar"
"You can hear the inside of his guitar," was my partner's comment on hearing the Lighnin' Hopkins you are there recording Goin' Away through the full Canor VR+ system fronted by the Orbe SE/Hadcock 242SE Silver/MusicMaker II front end, heard through Hammer Dynamics bass-mids and B&C DE-400TN-8 detailing the top end via Litz wired crossovers. "You know just what I mean; that's the great thing about metaphor," she added. "Indeed it is", your old scribe responds, knowing that recent fmri research indicates that more areas of the brain light up when metaphor is used or understood by test subjects than any other form of communication. This metaphor says it all. Hence, this metaphor communicates more about the Canor Precision Tube Phono Amplifier TP306 VR+ than a raft of measurements or a page of purple prose description. It is not measurable, it is a special quality preserved by the all valve reproduction chain from Sam "Lighnin" Hopkin's valve microphone in 1963, the all valve Ampex 300, rebuilt for Doug Sax's remastering through an all valve cutting lathe to a 200g pressing heard through the Canor (née Edgar) all valve system direct to our ears. It wasn't easy getting the system to this stage. The review sample of the Canor Precision Tube Phono Amplifier TP306 VR+ was no straight out of the box plug'n'play exercise. The TP 306 VR+ did not arrive with the previously reviewed Canor Precision Tube Amplifier TP106 VR+ and Precision Tube CD Player CD2 VR+, but came from the first batch produced, black finished and with the demand that it be collected in only 2 weeks after arrival. With its octal tubes, couture capacitors and substantial power supply there's be barely time to burn in and settle the sound before a quick listen and off it goes. With only 2 weeks to review the Canor the usual full range of tests and comparisons will not be available, dear reader. "What's the point of the review then?" demand plebs chorus, stage left, "How will we know whether to inconvenience ourselves enough to audition this rare objet d'art?" Hopefully another sample will be available to make fuller comparisons with established solid state and valve references. Furthermore it quickly became apparent that all is not well with this sample. Unlike the amplifier and CD player, the Canor TP306 VR+ did not arrive with valves pre-installed. However, every valve was housed in its manufacturer's packet clearly numbered and every valve socket on the phono pre-amplifier's boards was numbered too. I tried the unit with it's heavy steel cover on and off during the run in period to establish whether the shielding and isolation of this ferrous Faraday cage outweighs the disadvantages of the metal coffin. While trying these alternatives it became obvious this is the most vibration sensitive and microphonic audio component ever tested here. The main amplifying devices in the Canor Precision Tube Phono Amplifier TP306 VR+ are the famously lush 6SL7GT octal valves. Octal valves (so called for their 8 pins) are much larger than the B9a equivalents. The pin circle diameter of an octal is 17.45mm (IEC 67) while the B9a is just 11.89mm. This allows much more room in the glass envelope (GT=Glass Tube) for a bigger assembly of plates, heaters and getters (for some reason getters are far more common in octal audio valves) and is the reason that crosstalk between sections of double triodes is much worse (often less than -60dB) of B9a based double triodes like the ECC** family. However, the bigger, separate Bakelite based, large pin, octals are not universally superior. The octal small-signal triodes are notoriously microphonic compared with their B9a equivalents. A well reputed UK SET designer's immediate comment to me when he heard your old scribe was building a balanced phono stage with octals was "I wouldn't do that; they're too microphonic; stick to the ECC83". Your old scribe still chose the octals on sound quality grounds so I respect Canor's decision to work with the 6SL7, which also has a reputation among some American audiophiles as the finest phono pre-amplifier gain device. Hence, the choice between glass envelope sizes is not so clear cut and special measures may need to be taken to protect the valves from vibration. On further inspection your old scribe observes that the promised internal vibration isolation measures, much vaunted as part of the VR+ high-end package, are either non-existent or so sophisticated and clever to be invisible to the naked eye. The heavy steel casework rings like a peal of bells and this ringing is clearly audible through the microphonic valves. Tapping the casework (an extreme and unlikely activity but exaggeratedly symptomatic) produces an effect similar to somebody's Woody Woodpecker novelty mobile phone ring tone going off during "Your tiny hands are frozen" aria in a particularly fine production of La Boheme. An exchange of emails with Canor confirms that their supplier let them down with the vibration control components for the circuit boards, which did not arrive in time for the first batch of TP306 VR+ that therefore are below spec. It does not seem adequate to ship a batch of premium products without one of their unique selling points installed. Rather than allow this product to be hampered by susceptibility to external vibration, particularly in the light of the Tung-Sol 6SL7 ringing like an old spring reverb (allegedly an occupational hazard with many octal small signal valves), this reviewer opts to install maximum vibration isolation measures. However, the buyer of high end audio ought not to expect to have to install extra measures to overcome a shortfall against advertised specification. The Canor Precision Tube Phono Amplifier TP306 VR+ tops their range of phono stages, described as the "Reference" adding Mundorf caps in the signal path and that promised extra vibration isolation over the TP306 VR, the confusingly similarly named aluminium fronted all-tube MM/MC phono preamplifier. Two others the TP206+ and the TP206. 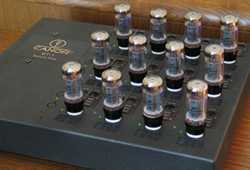 The bottom of the range 790€ CANOR TP 206 is an all valve phono stage for moving magnet cartridges. Even this base model features high-quality Teflon insulated metal RCA connectors, and well regulated HT (B+) to minimise noise and ensure more than adequate current delivery. The 1190€ TP206+ adds a moving coil step up transformer to this recipe and, in common with the plus (+) specifications throughout the Canor range, includes Mundorf capacitors from Germany. The TP306 VR is, as the different model number implies, a different circuit altogether. Avoiding global feedback and using passive RIAA EQ between amplification stages puts greater demands on the selection of valves to ensure both channels are identical. The icing on the 2090€ TP306 VR cake is that EZ81 (actually the review sample has the electrically identical 6CR4) and the Lundahl MC step-up tx. The 400€ extra for the plus model, TP306 VR+ gains tighter valve specs, higher spec Mundorf caps, Lundahl step-up transformer and should have additional vibration isolation. With time constraints preventing proper testing of the MC input and the vibration isolation measures absent from the review sample, this first review would stand well for the 2090€ TP306 VR model too. Canor pre-condition all the valves in their products and test them on their own proprietary TTM device, a policy they had to instigate due the the inconsistent quality of modern and NOS (New Old Stock) valves. These processes establish whether the valves meet their basic electrical performance criteria and also enable Canor to match them in pairs for consistent inter-channel performance. Canor also select the brand of valve that suits each circuit position, a technique I first witnessed employed by Doug Dunlop of Concordant over 20 years ago. Some designers of valve amplification believe that particular tube types should never be repeated in successive stages in any system to prevent their character dominating, while others believe that this is less important as long as different brands (and their different internal constructions) are varied and optimised for each circuit position. Some brands of valve are reputed to work best at very low signal levels while others excel in later higher signal amplification stages. Canor choose the more precise sounding Sovtek 6SL7 at the input of the Canor TP306 VR+ and the more euphonic modern Russian Tung Sol in the second gain stage between the passive RIAA sections. These Tung Sol's are the big offenders in the microphony stakes, one (right channel) being much worse than the other. Until a second, fully specified sample of the Canor Precision Tube Phono Amplifier TP306 VR+ arrives in the TNT-audio test bunker, first impressions will have to count and there will not be time to test the amazing range of cartridge loading and gain options. Yes indeed, this is an all valve stand alone phono stage with the full range of input options we come to expect from high end solid state devices and just a handful of valve products. At this price competition is rarefied and fierce so Canor will need to offer something special to compete with established benchmarks from ancient legends like the Marantz 7C, merely venerable like the Audio Research SP11, and more recent like the ARC PH7 (nearly $6k) or it's kid sibling the ARC PH5 (around $2k), or the recently reviewed AAAVT (Yaqim) MS-12B weighing in at a mere 390€. and even the built in phono sections of classics like the old Audio Research SP11, Jadis JP-80, Concordant Excelsior, (some with active feedback EQ stages, some with passive filter poles like the Canor) and hybrids like the Manley Steelhead ($7k+) and ARC PH7 (valve regulated, valve gain with an added solid state stage) Even thorough comparison with the solid state Aqvox 2Ci, popular with tnt-audio.com scribes, cannot be done justice with a wide enough range of material in the time available. The compressed time scale is such a pity as this phono stage promises so much. If I had been approached to design a single ended phono stage I would have connected the cartridge loading resistor straight to the grid of the perfect valve for the job, the 6SL7. Not to be confused with the ubiquitous octal, 6SN7 (the CV181 variant of which was reviewed in these pages), the 6SL7 has a reputation for TONE in the sense that guitarists use the term. The 6SL7's reputation was already the stuff of legend 20 years ago in the days of Sound Practices valve hedonism and is located in this very position in my own yet to be powered up breadboard DIY design. So your old scribes buttons are being pressed already. Having got some gain to the moving magnet output output the filter, why should RIAA equalisation (EQ) be handled by passive poles rather than feedback round the gain device (the 6SL7 in this case)? Because at ultra low signal levels the dominant narrative in some circles is that feedback EQ screws up the timing or generates TID (Transient intermodulation Distortion). Having said this, your old scribes favourite phono stages fall equally into the passive EQ/active feedback camps. 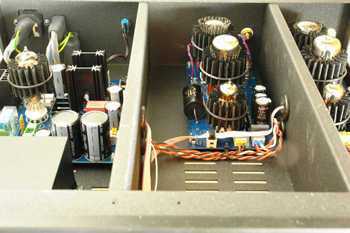 Likewise your scribes favourites include Naim K boards alongside the valves, to the extent of owning two custom power supplies for one pair of them. Sadly you won't read any comparisons using the now infamous judging system because this review sample (finished in black) has to go to a customer within 2 weeks. Hopefully a second sample might be forthcoming to make these comparisons and try the various gain and loading options. The first limitation obvious before being plugged in is that only 47kΩ is available on the moving magnet (MM) input, although 3 parallel capacitances are available. Generally, to flatten the response of a moving magnet cartridge above the midband up to the tip mass resonance, from about 2kHz to 20kHz, requires juggling of resistance and capacitance, Decca cartridges benefiting, in my experience, with 22kΩ, Shure M97 range from 33kΩ, and others like certain high inductance models from high Z. However, the Canor Precision Tube Phono Amplifier TP306 VR+ phonostage does offer a wide choice of loads and gains for the moving coil input. The extra gain for moving coil (MC) cartridges comes from a transformer. Valves capable of handling such low signal voltages, without overwhelming the tiny signals with noise, are rare as hen's teeth hence the choice of solution falls either to a transformer or an extra solid state stage. Canor take the transformer option but in the time available for this evaluation it just wasn't possible to change cartridge to rate the transformer's quality. All transformers have individual character depending on the design and materials. Vinyl records are recorded with pre-emphasis of 6dB/8ve EQ around 3 frequencies, the high frequencies boosted and the low frequencies cut. 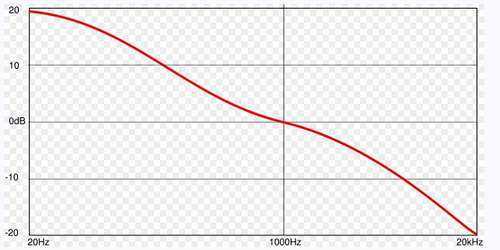 The low frequency EQ allows reasonable levels to be cut on the disc without the wiggles being too big for the cartridge to follow and to allow about 25 minutes to an LP side, hence it is a constant amplitude (theoretical) cut from 50Hz to 500Hz. The only frequency where the phono amplifier must be linear gain as specified is at approximately 1000Hz as the low filter pole is below 500Hz and the high filter pole at 2122Hz. The high frequencies are cut with a boost to enable the signal level to be high enough not to be overwhelmed by noise, pre-emphasis from 2122 Hz. This gives time constants of 75uS (2123Hz) and 318uS (500Hz) another one to reduce rumble at 3180uS (50Hz) was sometimes adopted in the Western hemisphere by about the 1970s but some CCIR discs were still being made in the Eastern block, geographically where the Canor is made, until very recently. A fourth filter pole has been proposed (most vocally by Allen Wright of VSE) at 50kHz to counterbalance the natural roll-off of most cutting lathes. So the phono pre-amplifier job includes not only the task of raising the signal from 5mV (MM) or micro-Volts (MC) but also of de-emphasis of the cartridge output by the inverse of the RIAA (Recording Industry Association of America) recording equalisation curve. Inversion EQ circuits range from the simple 3 caps and 4 resistors to ludicrously complicated active circuits; accuracy is paramount as instrumental timbre is rendered unrecognisable by inaccurate RIAA EQ. Older records had a variety of EQ arrangements, which some specialist collectors would need, but most of us will never encounter anything other than the RIAA of the Canor. Designing a phono pre-amplifier is probably the toughest assignment in audio electronics. It is a tough act to juggle the requirements of EQ, gain, noise, complexity and cost in a unit that consumers only notice now that they're not included onboard every integrated amplifier. Furthermore over half the gain in a MC cartridge turntable based system resides in this little box. Hence the phono stage has the capacity to screw up the whole sound of a disc replay system irredemably. The phono pre-amplifier is the gateway between the turntable and the rest of the system, the more accurate the tonal balance and the wider the opening (dynamic range and S/N ratio) the better. The Canor TP306 VR+ circuit looks designed to maximise dynamic range. The only ways S/N ratio (SNR, signal to noise ratio, or music to noise in this instance) could be obviously improved would be vibration isolation or a balanced, or 'difference' circuit. Some phono pre-amps like the Audio Research Reference 2 offer balanced as well as single ended circuits gaining an extra 6dB signal to noise ratio. Hence for this review additional vibration control measures have had to be installed. Pearl Valve dampers have been fitted to every valve in the Canor TP306 VR+. The TP306 VR+ is supported by four Yamamoto MGB-2 magnetic floating bases standing on a Something Solid Dissipating shelf, which is mounted on a XR4 rack, which in turn stands on four Missing Link Feet. All this and the TP306 VR+ is still highly microphonic and further investigation reveals that the signal boards (separate for each channel) are screwed firmly to the chassis base, such that they are in tension. Hence, like any flexible (both PCB and chassis) arrangement held in tension, they ring like bells. Indeed the dong and bong of these boards is perfectly coupled to both pairs of 6SL7 and also the 6922, to ensure that every nuance of this vibration is perfectly manifested in valve microphony. Thus with end user vibration controls added, the TP306 VR+ is placed on the top shelf of the Something Solid XR4 rack, which remains the reference isolation rack, isolating each shelf from the others. The supplied IEC kettle lead remains in its packaging and the test was conducted with the RMS Mainline lead as the least likely to bridge the extra vibration isolation measures being very flexible. Naturally the TP306 VR+ is CE marked and RHOS2002 compliant (hence using lead free solder which I find sounds better than the old tin-lead mixes) this phono pre-amplifier arrived equally well packed as its recently reviewed siblings. 12kg in a phono stage? That's heavy, implying substantial casework and linear power supplies. No global feedback, to avoid the pitfalls of TID, although there is local feedback to a degree in the choice of load and configuration of stage two and stage three. Without publishing trade secrets, the cartridge signal from a moving magnet cartridge is connected to the grids of both parts of a 6SL7 double triode via series resistors. This is inherently more stable than a direct connection that could result in RF problems. MC cartridges are matched with a Lundahl transformer (screened from the rest of the circuit) mounted right behind the RCA sockets. This first gain stage is a paralleled 6SL7, so that noise is reduced. Some argue that the slight mismatch between the two triode sections in one glass envelope causes loss of focus, but even if that were the case, the noise advantage has taken priority in Canor's design. The first section of the RIAA network connects the first paralleled 6SL7 to the second 6SL7, this configured as a symmetrical SRPP (in olde English 'bootstrap follower'), which seems almost de rigeur in valve phono stages promising both high gain and the low output impedance to drive the second reactive element of RIAA equalisation and behaves almost like a balanced (antiphase or difference) amplifying stage, with all the benefits that implies. The 'upper' triode (half the 6SL7) offers an active load to the 'lower' triode (the other 6SL7 half). Finally, after further RIAA correction, the signal meets the ubiquitous 6922 (milspec ECC88), which instead of being the common cathode follower in this instance is cascoded as a constant current 'White Cathode Follower' which obtains the lowest possibly impedance from feedback round the top triode. This is almost the opposite configuration to the SRPP and maintains almost symmetrical current swing (thus reducing the demands on the power supply), trading gain for ultra stable driving ability. Hence the Canor TP306 VR+ is one phono pre-amp that will not put extra demands on fancy cabling. 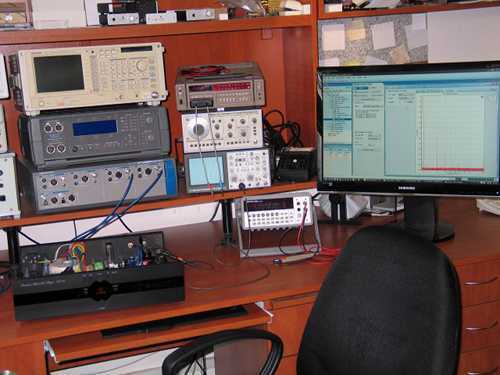 Furthermore, Canor use their own specially developed BT-1 Burn-in Tube and the TTM-1 'Tube Tester and Measurer'. Canor claim this enables 95% reliability rates, which is remarkable with NOS and declining standards of modern volume production, even premium brands like the Shuguang would still need testing by a manufacturer like Canor. There are no trade secrets being given away here as SRPP's depend entirely on careful choice of layout and resistor values to work properly, which Canor must have done as this is a very stable circuit. So far so good, if the vibration isolation is correctly installed in future production of the TP306 VR+. The black version of the system remote supplied with the black TP306 VR+ serves only to affect the TP306 VR+ with the whole system on/off switch. The CD player therefore always responds to power up and if it is not being used today, it has to run through its whole warm up sequence before the CD player will respond to the CD only power switch. This puts an unnecessary strain on the valves of the CD player, powering up and powering down needlessly; switch on/off cycles have the equivalent valve shortening effect of many hours of use at the recommended operating point. The heavy steel chassis, once the panels are securely bolted together, is relatively inert compared to some, but it still rings. It does benefit from some extra damping and mass loading in the form of a BrightStar Little Rock 5. The steel panels (with their inevitable magnetic fields and hysteresis) will have more effect on high sensitivity, high gain, circuits than power amplifiers, and there are arguments expousing the superiority of wood and copper chasses. Gain circuits are basically modulated power supplies, so it is encouraging to note that B+ (anode or plate supply depending on your local use of English) is rectified by EZ81 diodes. Valve diodes react faster, recover without overshoot and hence generate less RF. Thus the big voltage that is being modulated by the tiny input voltage, starts quieter when rectified and then ripple is smoothed by the capacitors that also act as the energy store for the circuit. The Canor Precision Tube Phono Amplifier TP306VR+ immediately impresses by doing little wrong and thus avoiding the pitfall of screwing up the whole vinyl sound. This is fresh from the box with a few hours overnight warm up but no signal played through it. After a couple of days idling with a couple of power down and power up sequences, the urgent timetable renders further burn in time too much of a luxury and the review begins. After familiar Fairport Convention material (I was there), the usual suspects and then Lightnin' Hopkin's (you are there) audiophile masterpiece provoked the comment in the title. After Hopkins, the only place to go is Muddy waters. Recorded in 1963, just like Hopkin's Goin' Away, Muddy Waters' Folk Singer in its Mobile Fidelity Sound Lab Original Master Recording transcription, justifiably has almost legendary status. The music would be worthwhile in MP3 format through the car radio, but the recording and pressing quality are among the handful of the best cuts ever committed to vinyl. It sounds good on any old rubbish with a fresh stylus (proving that the recording is the real source material not the turntable) but it really shines when the cartridge can track the wide dynamic swings and the rest of the amplification chain can swing big dynamics in the critical midband. Coupled to speakers with good air volume acceleration this album is a real treat. Morgan McInley's voice sounds direct and unamplified, his foot taps as clear as if on the listening room floor and the Canor TP306 VR+ conveys all this exceptionally well with the additional vibration control measures in place. Running Bruce Springsteen's Born to Run (original '75 vinyl copy, but played only on Shure M75EJ, M95ED, V15 III, ADC VLM, AKG P8ES, Stanton 681EEE, Ortofon MC20, AT110, Linn Asak T, Linn Karma, AT MC30, Dynavector Ruby, Sumiko BPS, Cartridge Man Decca, MusicMaker II, in that order) it becomes obvious that the soundstage of the Canor TD 306 VR+ is absolutely rock steady, locked into place, even with this familiar processed multitracked album. From the opening track Thunder Road (probably one of the finest pop songs ever written) the soundstage is accurately narrow and shallow, with no exaggeration and no cymbals parked in the tweeters but placed securely around the drum kit. The transparency of the TP306 VR+, and its accurate portrayal of dynamic range become immediately apparent with the title track, reminding this listener of how much the drums are compressed, indeed how the whole LP demonstrates that the loudness war and minimum dynamic range has been a problem for 40 years. The Canor TP306 VR+ does allow the immaculate timing of the E Street Band to shine through, suggesting that the no feedback passive EQ and zero global feedback have worked their magic, without the inherent feedback of the SRPP or Cascode stages detracting from that benefit. Rhythm (in amplification stages rhythm tends to be a function of power supply capacity and regulation - though not necessarily of regulator devices) is spot on, without the exaggerated pace of lean power supply alignments, nor the turgid effects of bloated bass. Hence PRaT, the foundation stones of all music reproduction, survives the electron journey through this phono pre-amplifier better than many highly priced rivals. Springsteen's The River can sound dull and lifeless on many systems, but the boogie factor keeps the pace as intended while the transparency of the Canor TP306 VR+ allows the individual strands of each song to emerge despite some dense production that threatens to overwhelm. Tracks like Crush on You often fail to reclaim the vitality of the material on Live From Asbury Park, NJ or The Wild The Innocent and The E street Shuffle but the Canor phono stage even exceeds the Concordant Excelsior in this respect. All amplification devices, be they thermionic or solid state, are non-linear and all tend to squash the top and bottom of the dynamic envelope towards the average. This is an inevitable consequence of designing (and living) within finite parameters; the only devices capable of unlimited dynamic range would have characteristic curves that go screaming off to infinity and none do (nor can they unless there are an infinite number of electrons in the universe). However, designers do have some tricks that minimise the effects of this inbuilt compressor function of amplification. One of the best of these is the use of active loads on each amplifying device that respond dynamically to the signal input. One of the best of these is the SRPP amplification stage. Hmm, there's a pattern emerging here; a phono pre-amplifier that excels at portraying dynamic shading happens to be one with a SRPP configured pair of triodes as the principle amplifying stage at the centre of the RIAA networks. The specified RIAA accuracy, although not tested, seems about right as the timbre of instruments seems right with no undue emphasis of certain frequencies or obvious up-tilt deluding listeners into imagined new insights. The distinct solid earthy tones of (what sounds like) a MusicMan bass being apparent on The River quite unlike the hot J Type tones of Marcus Millar with Miles Davis. The fundamentals of bass guitar tone structure are deep in the range below 500Hz and the harmonics of the higher register notes may extend above 2kHz and help define the note envelope and characteristic timbre of the instrument. Hence, inaccuracy in the first pole of the RIAA correction would be revealed and the close quality control advertised by Canor is borne out by this result. At the highest frequencies the clarity of harpsichord on the legendary Reference Recordings' Tafelmusik shines through the beautifully recreated acoustic. The difference between so called 'original instruments' and modern post romantic era fiddles is often a subtle difference in timbre and attack. Such differences are masked by systems with inaccurate RIAA equalisation or muddy timing caused by feedback approaches to EQ. Latin Quarter's Modern Times has scary high frequency equalisation that trips up many cartridges and phono inputs. However, if set up correctly, even a Decca (now London) cartridge will cope and the high voltage direct transient signal (no sluggish cantilever to tame the rise time) then tests the phono input. There is an argument that surface noise irritation factor is inversely proportional to transient speed and recovery capability of the phono input as much as to vinyl/stylus tip resonance. Naim input cards have always had a good reputation for this, and the Decca/Concordant Excelsior combination was not far behind, although the Concordant Exquisite with the same Source/Odyssey/Decca front end mis-handled surface noise appallingly. The Canor TP306 VR+, fully loaded with additional vibration control, slips in between the Concordant and the Naim. This is a creditable result, but when the Pearl dampers are removed and the original lid is screwed back on, the extra overhang brought by the uncontrolled resonances leave it trailing reference performance in the surface noise stakes. Another Reference Recordings audiophile classic is Mickey Hart (drummer of the Grateful Dead), Airto Moreira and Flora Purim's Däfos. The instrumental positioning in real space is a challenge to reproduce. It sounds good on almost any system with audiophile pretensions, but it sounds great on reference quality equipment. It served to identify the effects of removing the steel lid of the TP306 VR+ and the effects of the Pearl Valve Cooler/Dampers and of the Yamamoto MGB-1 and MGB-2 magnetic bases. Each change made a difference. Removal of the Pearl Dampers unaccountably reduced dynamic range, especially in the cliché Gates of Däfos and equally in Saudac˜ao Popular. Addition of the steel lid, carefully torqued down like a cylinder head, added a further hint of midrange murk, suggesting that either a non-magnetic material would be better and/or damping material should be applied (the output of a contact mike placed on the surface indicates the lid sings along with the music). Finally with the lid bolted securely on and the Yamamoto Magnetic Bases removed the sublime female vocals of Flora Purim seem polluted by upper bass bloom that was absent with the full vibration control measures in place. Bobby Vega's bass in 'Reunion' becomes much less distinct via the unmodified Canor Precision Tube Phono Amplifier TP306 VR+ than fully loaded. Jethro Tull's Thick as a Brick suffers the same effect when heard with and without the extra vibration control. Here the problem is again plummy upper bass, of the kind typically attributed to valve output stages by solid-state fans. Again, removing the lid, adding the Pearl valve dampers and inserting the Yamamoto magnetic bases underneath restores the balance known with other good phono stages, but with a scale and dynamic range special to the Canor. "So what conclusions does the old scribe draw," ask plebs, stage left "Given that he's mucking about with the equipment to get a decent result?" What could well be one of the great phono stages is let down in the review sample by the absence of advertised vibration control measures for the octal based 6SL7 valves. The Tung Sol second stage valves ring like the old spring reverb in a Selmer 2x12 guitar combo a friend used years ago and controlling this effect became an unnecessary ordeal. This reviewer cannot be sure whether the measures taken under review conditions to correct this problem were the equal of the specified measures that should have been in the Canor Precision Tube Phono Amplifier TP306 VR+ as advertised. The Canor Precision Tube Phono Amplifier TP306 VR+ does acquit itself exceptionally under the circumstances. Through Canor's matching Precision Tube Amplifier TP106 VR+ it offered as much information as that amplifier will resolve and if a second sample becomes available it will be tried through other amplifiers where extraction of that tiniest nuance is the designers' top priority. Where the TP106 VR+ excels in its portrayal of scale, dynamics and shading (to borrow a much used visual metaphor bordering on cliché) the TP306 VR+ phono stage is its equal. The headroom of each successive amplification stage within the TP306 VR+ is such that every known big scale recording was handled with such aplomb that there always felt like there's more available. RIAA accuracy is harder to achieve with passive stages, but successfully achieved in the TP306 VR+ as accurate portrayal of instrumental timbres demonstrates. The extra hassle of executing passive EQ is rewarded by state of the art timing. Portrayal of rhythm suggests good phase accuracy to the lowest frequencies and soundstage solidity (that is what 'stereo' means) imply minimum phase shift at high frequencies too. The overhang and bloom caused by the microphony of the octal based valves is reminiscent of that of the undamped Gyrodec chassis, but of much greater magnitude. Adding Pearl Valve dampers (not under review themselves) made a significant improvement, as did Yamamoto magnetic bases. Together these add significantly to the cost of the Canor Precision Tube Phono Amplifier TP306 VR+ and until the full specification samples of the TP306 VR+ are available, it is hard to know what overall conclusion to draw. 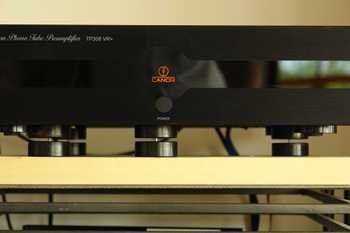 The Canor Precision Tube Phono Amplifier TP306 VR+ is very close to the state of the art in these respects, BUT, and it is a big BUT, very little needs to be done to lift this to true state of the art reference performance. Vibration control is the obvious problem and in this respect the TP306 VR+ as tested is really just a 2090€ TP306 and with the microphony problem discovered in this review would not be recommended. If the circuit boards were compliantly mounted and something like the AbsorbGel dampers were installed as valve bases it may be that this phono stage approaches the limit of what is possible from a single ended circuit. A version with a balanced output would be more universally applicable in the context of high end systems other than Canor's own TP106 VR+ integrated amplifier. This early production sample Canor Precision Tube Phono Amplifier TP306 VR+ causes your old scribe to hold back from recommendation as it does not meet the advertised specification and yet is so close to being truly great that it leaves the system with more disappointment of what might have been than what it actually achieved. "Over 7000 words on a review with no recommendation," scream apoplectic plebs, stage left "The old fool's totally ducked the issue."